That’s where Leung comes in. Born in London to Hong Kong parents, he moved to the city in 2009, when he was 26 years old, and has since embarked on a series of projects that combine art, design, community work, and urban agriculture. One of his most popular initiatives, HK Honey, connects local beekeepers with apartment dwellers who are eager to install beehives on their rooftops and balconies as an eco-friendly gesture (and to reap the benefits of delicious honey, no doubt). He’s currently focused on HK Farm, a network of rooftop gardens around Yau Ma Tei, one of Hong Kong’s oldest neighbourhoods and one that hasn’t seen much agricultural activity for the better part of a century. In Yau Ma Tei, Leung has tapped into a small but passionate community of artists, activists, and longtime residents who are nurturing life from between the cracks of the concrete jungle. The Mango King is a compact, middle-aged man with graying hair, a weathered face and well-worn jeans smeared with dirt. He lives in a lean-to under the shade of wispy horsetail trees, surrounded on all sides by speeding traffic. After ducking through a hole in a chain-link fence, we present him with a bag of ripe mangoes and he enthusiastically shows us around his farm. Cultivating food in the middle of a spaghetti junction is not an easy endeavor. There’s no running water, so the Mango King walks to a nearby shopping mall to fill up plastic jugs. And when he cooks, passing drivers are alarmed by the smoke and call the fire department. For the most part, though, the authorities leave him alone. I ask the Mango King why he started growing food — and why here, in such an odd location. He dodges the question and delves instead into a memory from youth. “Back in my village in China, I dabbled in farming with my friends – actually, it was more like I watched them grow things,” he says. “Growing things, it’s all about experience and how passionate you are. If you’re not into it, nothing will grow.” Later, Leung tells me that the Mango King doesn’t like talking about his past or how he ended up on the street. “I think he’s had a rough life,” he says. Leung and I thank the Mango King and make our way out of the interchange. Twenty minutes later, we arrive at So Boring, an informal pay-what-you-can coffee shop with folding tables set up on the sidewalk of Ferry Street. All the food here is locally-grown and organic, and they donate some of their waste — like pineapple heads — to the Mango King. We join a half-dozen staff and regulars sitting outside. Leung introduces me to Fredma, a 72-year-old woman who is short in stature but commanding in presence. After I decline a dish of locally grown pumpkin curry — I’ve already eaten — she insists. “Ho mei,” she says. “It’s delicious.” I relent, and it really is delicious — sweet, earthy, and a bit spicy. Leung and Fredma met through Wooferten, a group of artist-activists that run a community art space nearby. Fredma (so nicknamed because she has a son named Fred), who has close-cropped, silver hair and fine features, shows up nearly every day and she is now an urban agriculture enthusiast. Last year, Modern Farmer magazine featured her Typhoon Tea, which she created on a stormy day with peppermint, honey, and lime harvested from Leung’s roof. In many ways, Fredma embodies what’s best about Hong Kong: a make-do attitude that can lead to brilliant, improvised responses to adverse urban conditions. The same kind of ingenuity can be seen on Canton Road, where the owner of a Chinese medicine shop, Mr. Pang, has turned the street signpost outside his business into an ad hoc planter that now overflows with basil and other herbs. Inspired by Pang, Michael Leung and Wooferten have been making planters for street signs around the neighborhood, working with shops to decide what to grow and teaching them how to water the plants. Pang uses a remarkable device that consists of a plastic container attached to a long rod and a string that releases water when pulled. “They think they’re just growing stuff, but we see it as guerilla gardening in that they’re making use of vacant public space,” Leung says. He’s only half joking. Hong Kong’s government is no friend of guerilla gardening, running television ads against illegal planting and tearing up informal vegetable and herb patches that elderly people grow on vacant pieces of land, with the pretext that illegal gardening could attract mosquitoes and cause landslides in hilly areas. There aren’t many alternatives, either — there are just 22 government-run community gardens in Hong Kong’s public parks, and demand is so high that plots are rented out for only four months at a time. And though the government’s Greening Master Plan has made big strides to introduce more greenery to public spaces by planting shrubs, trees and flowers along roadsides and in other concrete-heavy areas, it makes no allowance for productive gardens. “Basically, we adopt the ‘right species at the right place’ principle in selecting plant species,” a spokeswoman for the Civil Engineering and Development Department tells me when I ask why all this new greenery does not include edible plants that people could harvest. Sum developed her green thumb after moving to a studio in the countryside. “I was not making any art — I just had a good life, cooking every meal, planting my own food,” she says. That led her to Mapopo Farm, an organic agricultural settlement active in Hong Kong’s local food movement, and from there she ended up working with Yau Ma Tei Gardener, a group that runs this rooftop farm. As we sit on the roof, another Yau Ma Tei gardener named Step Au joins us. She and Sum take me on a tour of the rooftop, where ginger, lemongrass, pineapples, and potatoes are growing in a variety of recycled plastic buckets, old wooden drawers and small containers donated by a Chinese medicine shop. As I leave the rooftop, I descend the narrow stairwell and hear violin notes coming from an elderly musicians’ association on the second floor. I turn right as I leave the building, and as I dodge pedestrians on Shanghai Street, I notice something growing inside one of the street signposts. I walk closer and look up: chili peppers. This story was originally published in Slate and Roads & Kingdoms. Next Friday, August 1, Michael Leung will exhibit his work with the Mango King and other Yau Ma Tei gardeners at the Oil Street Art Space in North Point. At the moment, the Mango King continues to cultivate his plot of land, but he could be evicted at any moment. Read more in this thorough update from Leung. 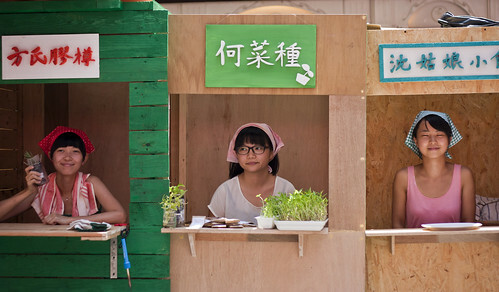 This entry was written by Christopher DeWolf , posted on Wednesday July 23 2014at 11:07 pm , filed under Architecture, Art and Design, Asia Pacific, Environment, Public Space, Society and Culture and tagged Guerrilla Gardening, Hong Kong, Informal Space, Kowloon, Mango King, Michael Leung, Urban Agriculture . Bookmark the permalink . Post a comment below or leave a trackback: Trackback URL.